East Hampton remains among one of the most desirable locations in America with beautiful secluded estates, sprawling countryside and miles of picturesque coastlines. It was therefore important to the homeowner that their 8,000-square-foot house with beautiful views would not be disturbed by the technology within their home. Crescendo Designs chose to implement a range of products which would provide a premium, yet discreet addition to the space. 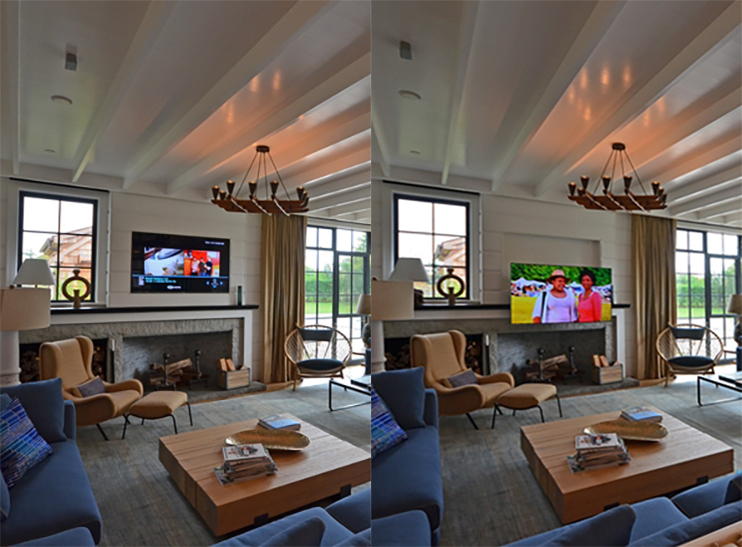 Architectural in-ceiling speakers have been implemented throughout the property to provide a seamless audio experience in every area of the home. It therefore made sense to align the hidden audio experience with Future Automation mechanisms to provide an optimal viewing experience. As the homeowner has a feature fireplace within their living area the display would sit unnaturally high on the wall with a traditional mounted display. The EAD (Electronic Advance and Drop) mechanism has been specifically engineered to tackle this mounting scenario. It provides a smooth and quiet movement forward, allowing the mechanism to manoeuvre over the existing mantle piece. To make the installation even more discreet, Crescendo Designs installed the Advance and Drop mechanism within a recessed wall box that had been custom designed to match the colour of the existing feature wall. This choice ensures that the void behind the display blends seamlessly with the rest of the room when the mechanism is fully extended. 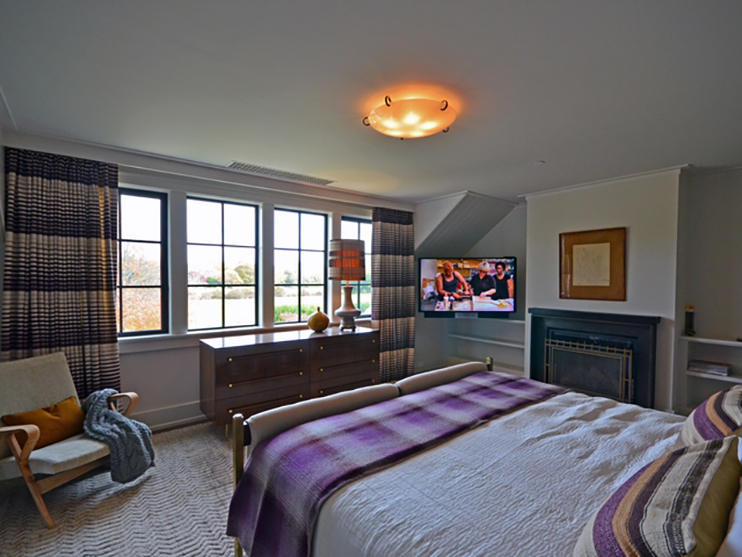 These convenient automated features also extend into the bedrooms where iPad controlled audio, visual and lighting control can be used to adjust the ambience and feeling of the room. A traditional wall mounting system would have provided an off-axis viewing angle for the display and standing the display on top of the cabinet would have obscured the view out of the main window, blocking valuable light that would bathe the interior of the room. Once again, this issue was able to be solved by integrating a customised PSE90 (Motorised Articulated Bracket) into the space below the alcove. The PSE90 can rotate towards the homeowner as they lay in bed for an optimal viewing experience. The compact design of the mechanism ensures that the mechanism remains hidden when the display is stowed, following the theme of 'Hidden Treasures' throughout the property. Crescendo Designs are an approved Future Automation dealer based in New York, USA. They pair the best in high-end technology with the art of great interiors, for the ultimate lifestyle experience. Crescendo Designs can be contacted via www.Crescendodesigns.com or on +1 (631) 283 2133.